By Harlan West, Design and Marketing Professional with more than 25 years of experience designing materials for major healthcare organizations, municipalities and large corporations. By Harlan West, Design and Marketing P rofessional with 25 years of experience designing materials for major healthcare organizations, municipalities and large corporations. Printers have moved from being detrimental to the environment to being very supportive of the recycling movement. While at a press check this weekend for a job on the web press, I was actually reminded of how much large commercial printers do to promote recycling and sustainability. In fact, the printing industry is one of the biggest adherents to recycling. First and foremost, most printed products today are printed on paper stock made from recycled paper pulp. In addition, the printing industry has moved away from using colored papers due to the difficulty and added cost of recycling these papers. Today, the large amount waste created from printing during the make-ready stage and bindery stage is typically collected, baled and compacted into a block and then sold to companies that make products from paper and printing waste. Indeed, the printing industry gets an undeserved bad wrap for being environmentally unfriendly. In all actuality, most printers today print on papers that are made of recycled fibers and they send the waste from the printing process, otherwise known as “make-ready” as well as the used metal plates off to be recycled. 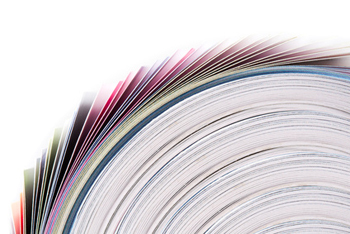 Nearly 60% of printed publications today are printed on paper made of recycled fibers. By using recycled papers and planting new trees, the printing industry is taking essential steps to reduce the deforestation of our earth. The great thing to keep in mind is that paper is not only biodegradable but it is also recyclable and reusable. As stated in our blog post, Paper Adds Weight to Your Marketing, there are a wide range of recycled, environmental paper choices. Using these papers helps to demonstrate a commitment to our environment. There are 100%, 80% and 30% post consumer fiber choices as well as 50% alternative fibers/50% consumer fibers. These papers are Processed Chlorine Free (PCF), FSC® Certified (meeting the mark of responsible forestry), Green Seal™ Certified (a minimum of 30% post consumer fiber with mill processes and packaging that are environmentally preferable) and Carbon Neutral Plus (helping to reduce carbon emissions with a commitment to conserving the environment). So next you visit a large commercial printer for a press check, ask to see how they are reducing their carbon footprint. You’ll probably be pleasantly surprised. If your company needs an innovative newsletter, annual report, creative consulting or print management, please contact HWDS at hwdesign@west.net. We make beautiful things happen. To find out more please visit westdesign.com. While at a Santa Barbara paper event this past week, I was quickly reminded of the importance of paper. In the digital world we live in, we, too often, overlook the fact that humans are tactile beings. We respond better to communication messages if there is a tactile component. The best solution for effective communication is a campaign that includes both a print and a social media component. The choice of a paper is as important as choosing a particular design or color treatment. Paper choice is so important because depending on the texture, weight, brightness, opacity, color and trim, it can enhance a design and increase the effectiveness of the message. High-grade papers can portray strength and importance. Vellum sheets, for example, can show elegance and can act as a “window” to other pages. Paper comes in coated and uncoated stocks. Coated stocks can have gloss, silk, satin or matt finishes. Uncoated paper stocks come in felt, velvet, velum, silk fiber, smooth, linen, and laid finishes. Papers come in an extensive range of basis weights, shades and finishes. Adding foil stamping or embossing can add dramatic effects to a report cover or annual report. The brightness and opacity of a sheet of paper are factors in determining the cost of the paper. Generally the higher the opacity and brightness, the higher the cost of the paper. Brightness is one of the characteristics used to determine a paper’s grade. A no. 5 paper grade has the lowest brightness (less white and uniform texture) while a grade no.1 has the highest brightness. Opacity is the degree of show-through of printing on the reverse side of the sheet. Complete opacity is at 100% and complete transparency is at 0% in terms of the percentage of reflectance, a measure of opacity. Economy sheets generally have a grade of 3 or lower and have a lower rating of brightness. Today, there are some wonderful low-cost, short run options for printing on the digital printing press. The HP Indigo® press, for example, can print beautiful short runs of large format posters using a process of wet ink using a CMYK dot configuration similar to conventional offset printing. It uses liquid ink rather than toner and a six-color ink system, including light cyan and light magenta, to produce photo-realistic colors and tonality. Since there is no make-ready (the wasted sheets needed to get the press up to speed and quality), there is substantial cost and time savings. What you see is what you get (WYSIWYG) and there is little need for a press check. This is important for clients who have tight budgets as well as tight deadlines. Even more exciting is the ability to print with white opaque ink, something not previously possible with traditional offset CMYK printing. Other benefits include unique bookbinding options where pages are hand sewn and gathered for the binding, using a technique that allows the page to lie flat when the book is opened. This works in place of perfect binding. Due to consolidation in the paper industry, much the result of non-print solutions such as online non-printed communications, there are now fewer paper houses and paper stocks to choose from. But that does not mean that a project still cannot be printed on an elegant paper stock. When deciding on a paper stock, it is best to determine who is the audience for the piece and what is the shelf life. If a piece has multiple uses and a longer shelf life, it might be worth it to spend extra money on the paper stock. If the intended use is an invitation for an elegant affair where image is important, a high-end stock may also be warranted. But when a mass mailing is involved and the piece has a shorter life-span consider a more economical paper stock. A good rule of thumb is not to spend more on the paper if the ultimate purpose does not warrant it. 1) Premium papers for offset printing jobs. This is reserved for or those high-end jobs when the client is not on a shoe-string budget. Some examples include annual reports, automotive brochures, restaurant menus, jewelry boutiques, high-end coffee table books, lithographs of art and photography and beautiful paper sample books. These papers capture fine details, print with cool and crisp blue tones, and have unparalleled readability and clarity. Many premium and environmental papers are also often acid-free. Acid-free papers are manufactured in an alkaline environment. This helps prevent the paper from discoloring and deteriorating over time, thereby adding to the longevity of the printed piece. 2) Mid-range quality sheets. These are less expensive than the premium sheets and are commonly used for newsletters, brochures, posters and collaterals with a longer shelf life and small press runs than direct mail pieces or catalogs. Here, paper quality is important but the job does not warrant a premium sheet. 3) Economy stocks. These papers offer excellent print performance at a reasonable price. They allow you more bang for your buck. These are generally used for projects where the budget is tight and quality is not as big of an issue. Some examples include quick print flyers, direct mail pieces, news magazines, advertisements, seat drops and mailbox stuffers. 4) Web press papers. These jobs are printed on from a huge roll of paper that is fed through the printing press. Typical web fed jobs consist of newspapers, park district/recreation catalogs, newspaper inserts, magazines, direct mail pieces, class schedules and large catalogs with large runs, often 10,000 or larger. Some web presses print at speeds of 3,000 feet per minute or faster. 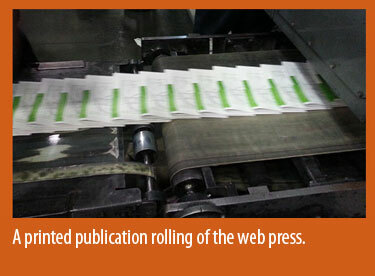 Different options are available for the web press but usually these are not the top of the line, premium papers. The web press usually runs grade no. 2 or lower paper stock and has a high dot gain, usually around 20%. 5) Environmental papers. 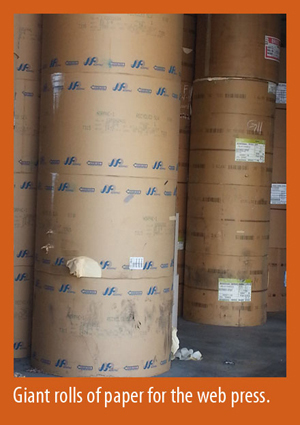 There are a wide range of recycled, environmental paper choices. Using these papers helps to demonstrate a commitment to our environment. There are 100%, 80% and 30% post consumer fiber choices as well as 50% alternative fibers/50% consumer fibers. These papers are Processed Chlorine Free (PCF), FSC® Certified (meeting the mark of responsible forestry), Green Seal™ Certified (a minimum of 30% post consumer fiber with mill processes and packaging that are environmentally preferable) and Carbon Neutral Plus (helping to reduce carbon emissions with a commitment to conserving the environment). 6) Digital print papers. 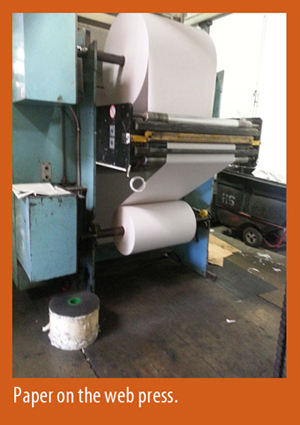 These papers are made specifically for use when an alternative is needed to conventional offset printing. Typical digital print jobs have short runs or consist of on-demand printing. Digital printers require exceptionally smooth papers, guaranteed for digital offset and production laser print equipment. These papers are also optimized for dry toner presses, color laser, HP Indigo and offset digital printers. The touch and feel of paper can add substance and bulk to your message. Use it to get in touch! If your company needs an innovative newsletter, annual report, elegant event invitation, recreation guide or just plain creative consulting, please contact HWDS at hwdesign@west.net. We make beautiful things happen. To find out more please visit westdesign.com.